Stoltec Moto has the only drop-in springs for the 17+ FZ-10 (and naturally, the 16+ MT-10). We have two sources of supply, both of which are manufactured right here in the USA and available in a variety of rates. These springs are stock-replacement and do not require new spring spacers. Save yourself the hassle of calculating new air volumes and trimming spacers! 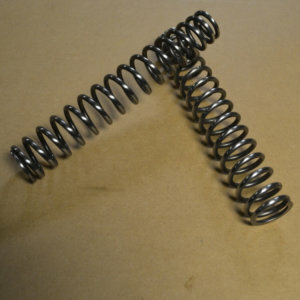 Unlike most aftermarket springs, these are custom wound with a taper on one end to center the springs and reduce spring noise – just like the OE springs. Contact us for assistance in selecting a spring rate and oil weight. Outstanding!! Your time and effort equals easy peasy for someone to order this upgrade!! Do you have installation instructions for these? Does one need to remove the fork tubes or use special tools? I'm interested in these, but would like to understand how hard it would be to install myself before I pull the trigger.